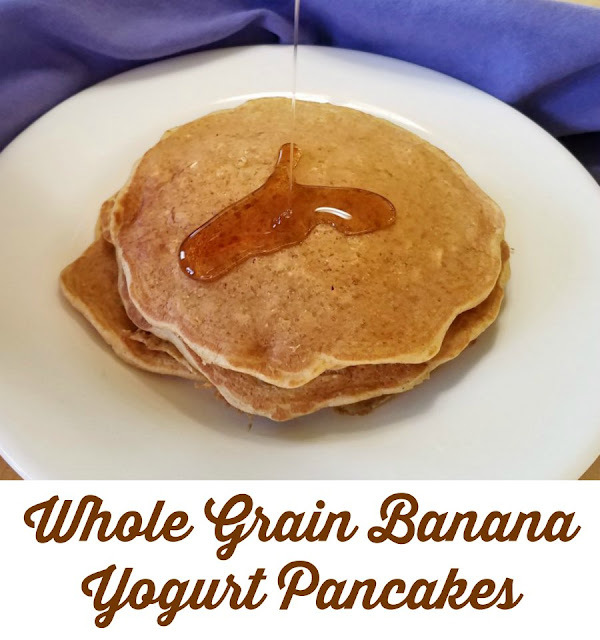 Pancakes loaded with the good stuff, whole grains, banana, yogurt and no added sugar! They are soft and flavorful and ready to be your breakfast! Sometimes you just want pancakes. Or is that just me? I have been really wanting to turn some of our fresh strawberries into pancake topping since they started ripening. But we don't ever sit down for breakfast. I certainly don't have the time to make a full breakfast during the week. On weekends it always sounds nice, but we don't follow through. So, I decided if I wanted to have my pancakes, it was going to have to be for dinner. The problem is, with all of the junk food we have had around lately I was feeling guilty about having all that sugar for dinner. So, I made a healthy pancake instead. 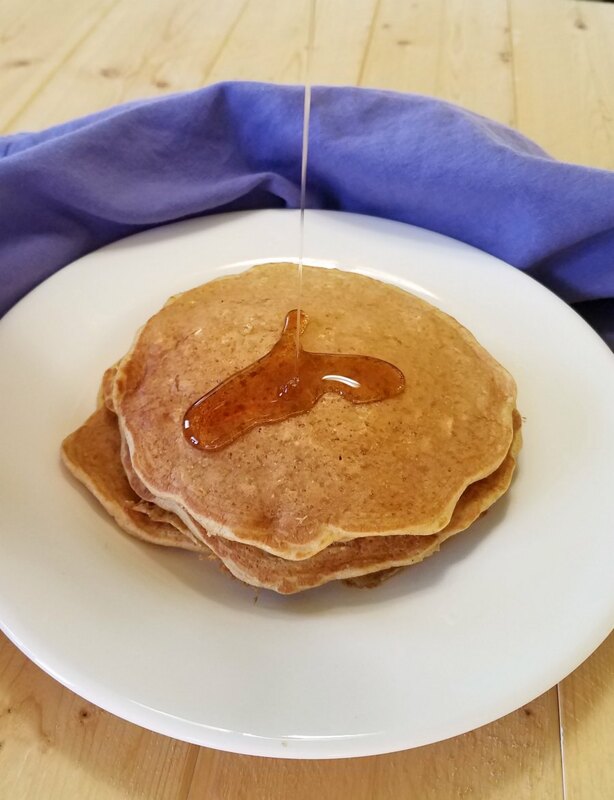 The only sugar in these pancakes themselves comes from a banana. 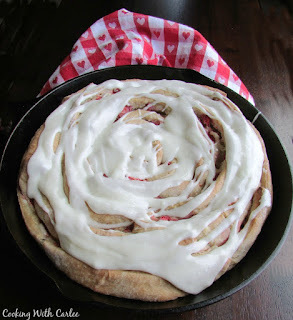 The topping was mostly fresh strawberries, with just enough real maple syrup to make them the right consistency. (As you can see we also enjoy them with plain old maple syrup as well!) Add to that yogurt, whole wheat flour and oatmeal and there really isn't much to feel guilty about. Except the bacon. But hey, isn't it worth it for bacon?! In a small bowl, mix together the flour, oats, salt, baking powder, baking soda and cinnamon. In a large bowl, mash banana until smooth. Stir in the egg until well mixed. Then add milk, vanilla and yogurt, stirring until combined and smooth. Stir the dry ingredients into the wet ingredients until just combined. Do not overmix. Heat a griddle or skillet over medium heat. Coat with oil (I used coconut oil, but vegetable oil would work fine). Once hot, spoon batter onto pan 1/4-1/3 of a cup at a time. 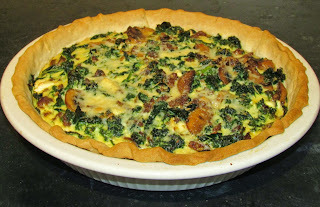 The batter is relatively thick, but if you work quickly you can spread it into circles. Cook for about a minute on the first side. They are ready to flip when they begin to bubble. Flip and cook on the other side for another 2 minutes or until cooked through. 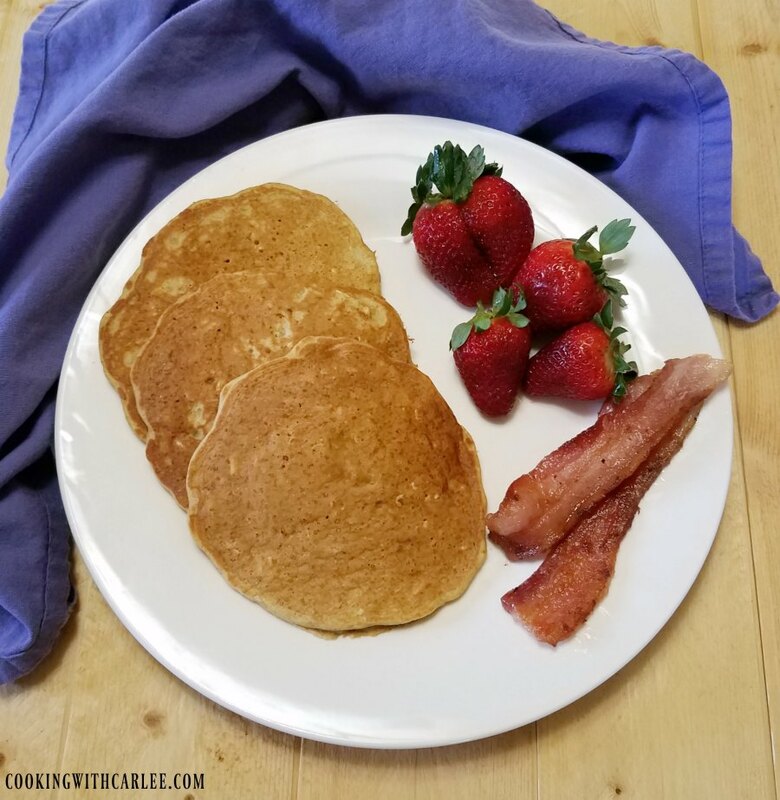 If you want to keep your pancakes warm as you finish the batch, you can place them in a 200 F degree oven until ready to serve. Matt's Famous Trifold Omelet - The man sure knows how to make an omelet! Strawberries and Cream Skillet Roll - another excellent idea for fresh strawberries! 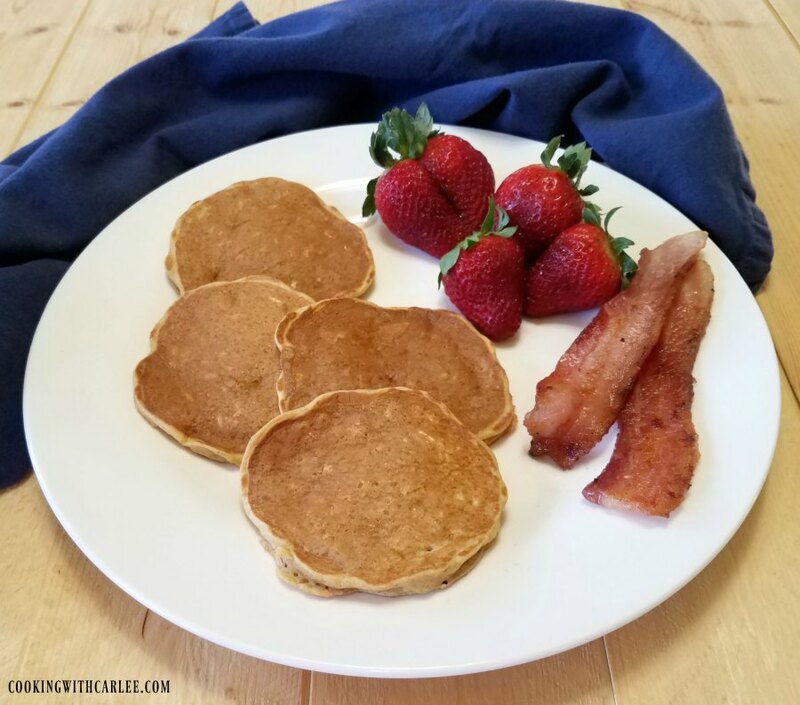 These look so delicious, Carlee!Having pancakes for dinner is perfectly acceptable! We love pancakes, but honestly I am getting really tired of making buttermilk ones, and my kids would love these! Pinned and tweeted! Can't wait to try them! We love having breakfast for dinner! Breakfast foods are my favorite! Those pancakes look very tasty. I've never tried using yogurt in pancakes. It is a really nice addition to keep the pancakes light and fluffy! Breakfast is a favorite of mine too! I hope she loves them! Thanks for hosting, see you Friday! I love it when the two come together ;-) Thanks for hosting! Love the idea of sweetening the pancake with banana and no sugar. Will have to give this a go! Thanks for sharing with the #BlogFair. Me too! We eat way more sugar than we should already, so I like being able to sub in fruit when possible. Thanks for hosting!